The National Association of School Psychologists(NASP) represents and supports the profession of school psychology by advancing effective practices to improve students' learning, behavior and mental health, and by maintaining essential standards for ethics and practice. The Colorado Department of Education (CDE) Through setting a clear vision for increasing student performance, CDE continually supports the advancement and improvement of the state’s education system to prepare all learners for success in a rapidly changing global workplace. The goal of Division 16 of the American Psychological Association (APA) is the enhancement of the status of children, youth, and adults as learners and productive citizens in schools, families, and communities. Second Wind Fund (SWF) believes that every child and youth at risk of suicide should have access to the mental health treatment they need. 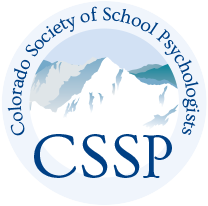 SWF matches Colorado children and youth at risk for suicide with licensed therapists in their communities and will pay for up to 12 sessions of therapy. The mission of the National Child Traumatic Stress Network (NCTSN) is to raise the standard of care and improve access to services for traumatized children, their families and communities throughout the United States. Interested in policy and advocacy? Check out the NASP Policy Action Center and see how you can get involved and advocate for kids, schools, and the field of school psychology!